Gluten-Free Prairie has got you covered. Our pure gluten-free oats are a great way to start the day. And if you’re on the run in the a.m? We understand. We are too! Don’t think you have the time to eat a healthy breakfast? We can relate. 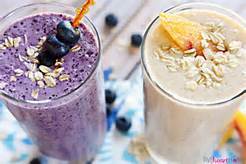 But before you reach for that high sugar, overly processed “energy” bar, check out this super simple high protein smoothie. This super quick high protein smoothie will get you going and keep you going – until – if you’re like us, you stop to enjoy a Hunger Buster Cookie for lunch. On the run in the a.m? We are too! This super quick high protein smoothie will get you going and keep you going - until - if you're like us, you stop to enjoy a Hunger Buster Cookie for lunch. Mix all together in blender until oats are completely blended in.